Part I: Why has history forgotten this giant? Kuldip Nayar was Lal Bahadur Shastri's press advisor from 1960 to 1964 and travelled with him extensively.�He provides�an insight into the former prime minister's�life. Shastri has been forgotten by the nation. He has been pushed into the background. I have no doubt that there was a Congress conspiracy to underplay Shastri after his death. The Congress is the party that should have put him to the fore but I remember visiting a Congress meeting where Shastri's portrait was not even displayed with respect. He simply didn't fit in. Mrs Gandhi was strongly against the Congress old guard. When he died there was a strong resistance against his cremation in the area where Gandhi and Nehru had been laid to rest. Most Congressmen wanted his body taken to Allahabad. When Mrs Lalita Shastri said she would go public only then did the Congressmen relent. They even protested against inscribing the slogan -- Jai Jawan, Jai Kisan on his samadhi. Then again, only when Mrs Shastri threatened to go on a hunger strike was it was allowed. After leaving the Press Information Bureau I became a reporter. Wherever I went to meet Congress leaders, I was labelled as 'Shastri ka aadmi' [Shastri's man]. Now, a committee has been set up by the Congress-led government to celebrate his birth centenary but it seems like an afterthought. I think after the death of Shastri, the Congress did not know where to fit him. When Mrs Gandhi succeeded him, the Congress didn't know where to put his legacy in the scheme of things then. Shastri stands for simplicity and consensus. Shastri represents an ideology that was right of Centre but not left of Centre. After all, he is the man who said we need the five-year plan but let us have a one year holiday from plan. I remember vividly a small incident that brought out the stark difference between the two (Shastri and Indira Gandhi) leaders. During Shastri's tenure his home in Janpath was upgraded quite a bit to suit the status of a PM. After his death, while searching for a suitable home Mrs Gandhi went to see Shastri's home. She entered the home, had a round inside and said, "middle class!" Shastri was selected by veteran Congress leaders K Kamaraj, Neelam Sanjeeva Reddy and S Nijalingappa to lead the nation. Moments after Nehru's death I asked him who should become PM, he said it should be the unanimous decision of the Congress. He gave two names in order. First, Jayaprakash Narayan and second, Indira Gandhi. He told me he wanted a unanimous decision over the selection. "But if there is a contest (which Morarji Desai contemplated) then I can defeat Morarji Desai but not Indira Gandhi," he told me. Probably he was right. However, the question didn't arise because Kamaraj was asked to talk to members informally. Shastri was made PM but Morarjibhai never accepted the decision. After Shastri became PM he had to face the war with Pakistan. When the Chamb border was attacked Shastri was asked to take a tough decision whether to cross the international border. The army chief said it would be difficult to hold on for long at Chamb. Shastri gave the order saying -- before they can capture Chamb you should capture Lahore. After the war was over, I asked Indira Gandhi if Nehru would have allowed the crossing of the international border. Mrs Gandhi said, 'Whatever the generals would have advised him he would have followed." After the war, Shastri's name was all over. Before the war many people laughed at him for his softness but not after the war. He came out as a tough hero. His toughness was evident at Tashkent. 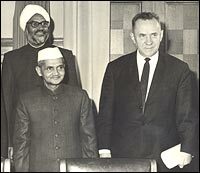 When Russian Prime Minister Alexei Kosygin (left: Shastri with Kosygin and Indian's then external affairs minister Swaran Singh) wanted Shastri to sign the agreement for peace with General Ayub Khan of Pakistan after the 1965 war, Shastri insisted on adding the assurance, "never again will weapons be used to sort out problems between India and Pakistan." Ayub was maintaining a vague stance by quoting UN resolutions. "Then you will have to find another PM," said Shastri during the arguments. In the final agreement General Ayub Khan had not mentioned those words but Shastri continued to press for it. Ayub finally wrote it at the very last moment. General Ayub's handwritten assurance is still preserved in the Indian archives. Shastri was a slight person but with a strong mind. If the Congress wants to celebrate Shastri, it will have to re-emphasis the honesty of Shastri. He stood for the small men of India. But the Congress has changed completely. Since Mrs Gandhi said that corruption is a world phenomenon, Congressmen are not losing sleep over it. Neither can I imagine Shastri imposing the Emergency. All those Congressmen seen active during the Emergency are part of this government. Ambika Soni is a confidante of Sonia Gandhi, Pranab Mukherjee, Arjun Singh, Kamal Nath all were part of the establishment then. How can these leaders bring in the values of Shastri? The Nehru-Gandhi dynasty culture has also played a role in minimising Shastri's legacy. When Shastri was made a minister without portfolio in the Nehru's Cabinet, he was uncomfortable. Once in a huff he told me, "I shall quit and retire to Allahabad." While cajoling him not to entertain an such idea I said, "Nehru has you in his mind." Shastri said, "Unke dimag main to unki putri hai. (He has his daughter in his mind as successor.)" As soon as Shastri died the dynasty culture returned to the Congress. Shastri's message of life was that if he could become PM anybody could because he was a common man. As the Bible says the meekest shall inherit the earth, he proved it. In 1942 (during the Quit India Movement), when he was in a jail, his daughter was ill and he was released on parole. But he could not save her life because doctors had recommended costly drugs. Shastri never made money. In 1963, on the day when he was dropped under the Kamaraj plan I went to meet him. He was sitting in his home without a light. "Why are you sitting in the dark?" I asked. He said, "From today all expenses will be borne by me." He told me as a MP and minister he didn't earn enough to save for his rainy day. On that evening, I told him to turn a columnist to earn some money. So he wrote a column on Lala Lajpat Rai. That was the first syndicated column in India. I syndicated it to four newspapers and collected Rs 500 from each. Quite a hefty sum! The second column was on Nehru but before he could write more he was recalled to�the Cabinet. I don't see the revival of the values Shastri stood for. A day before his first press conference after becoming PM I asked him what will be your message tomorrow? He said: "I'll tell them that during my tenure there will not be any increase in food price and as PM of India I would ask members of the Planning Commission to have one more column in their charts to show me how many jobs will be created after spending thousands of crores of rupees." He was a man concerned about the common man of India. Can these values return to this country? 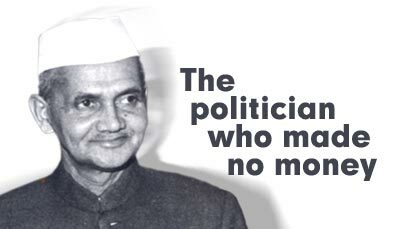 Sub: Did shri Lal Bahadur Shastri died a natural death?